Cabinet resurfacing is one option among many to give the cabinetry in your home a bit of a facelift. However, cabinet resurfacing is generally regarded as a lower-quality form of what is known as cabinet refacing. Both ”resurfacing” and “refacing” involve stripping cabinets of doors and drawer fonts, covering cabinet frames with a veneer, and replacing doors, drawer fronts, handles, knobs, and hardware with all new ones. The cabinet resurfacing process may seem cut-and-dry when put simply, but there is actually plenty of room for error involved. Wood can split, adhesives can fail, improperly measured veneers can leave old cabinet frames visible, and poor installation can leave your cabinetry looking sloppy. Don’t trust your cabinetry to cheap cabinet resurfacing. Instead, let the experts at Reborn Cabinets, the cabinet company with decades of experience, provide you with our Vianvi ® Signature Cabinet Refacing service. 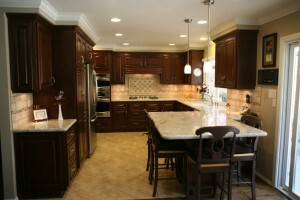 We have been refacing cabinets throughout southern California since 1983, and along the way we have perfected the art. Furthermore, we provide a level of customer service that is unparalleled in the remodeling business, and we make it our chief goal to ensure all your home improvement needs and wants are being met. This is what makes working with Reborn Cabinets truly The Ultimate Remodeling Experience®. "The refacing turned out beautifully. Each day they battled hours of traffic to be here and still completed their work happily and in a timely manner."